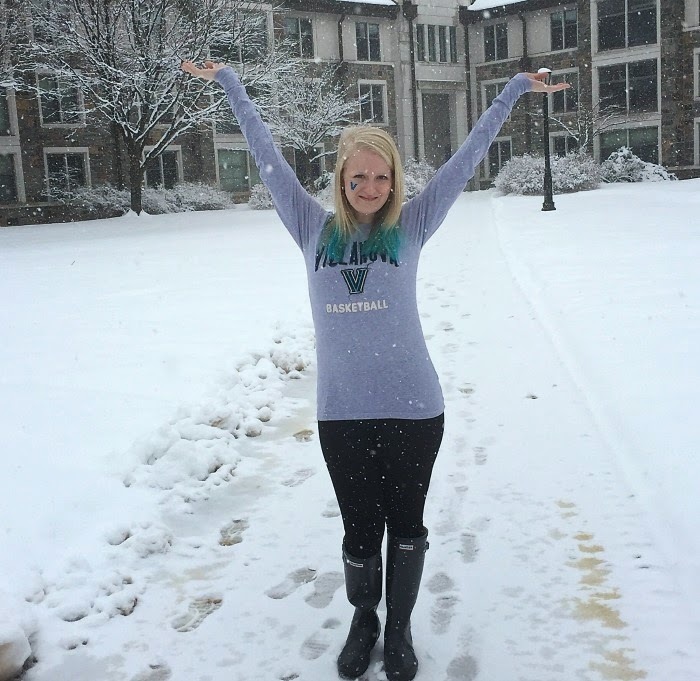 March Madness is here and I seriously could not be more excited! Throughout high school I knew next to nothing about sports and had no interest in learning about them either. 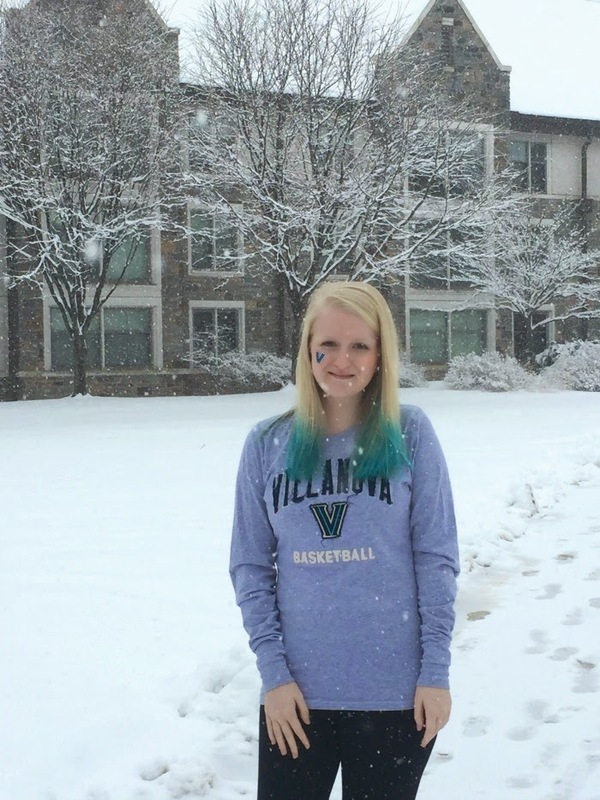 However when I started looking at colleges I began to take a bit of an interest in them and started watching Villanova basketball regularly as it was my top choice school. 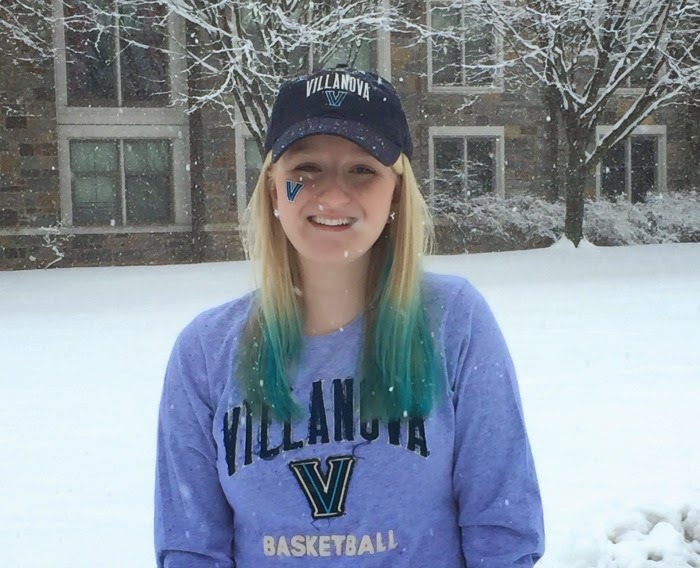 Over the last four years that initial interest has grown into a love of anything Villanova basketball (I also enjoying going to our football games too!). When I was a freshmen it was a rough year for our team and as my love and knowledge of basketball has grown over my time here, our team has gotten better and better. We have had an incredible season this year and today is our second game in the NCAA Tournament as a #1 seed. 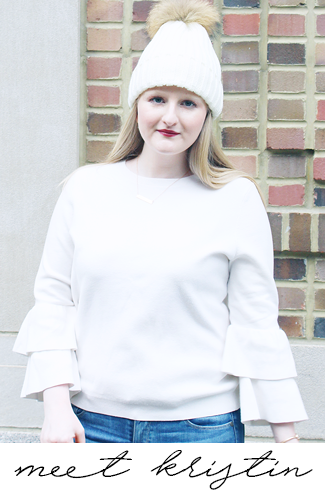 As a girl who loves fashion I'm sure you can imagine that one of my favorite parts of going to or watching games is getting dressed and showing my school spirit through what I'm wearing! Today I'm going to show you how to dress like your team's #1 fan. 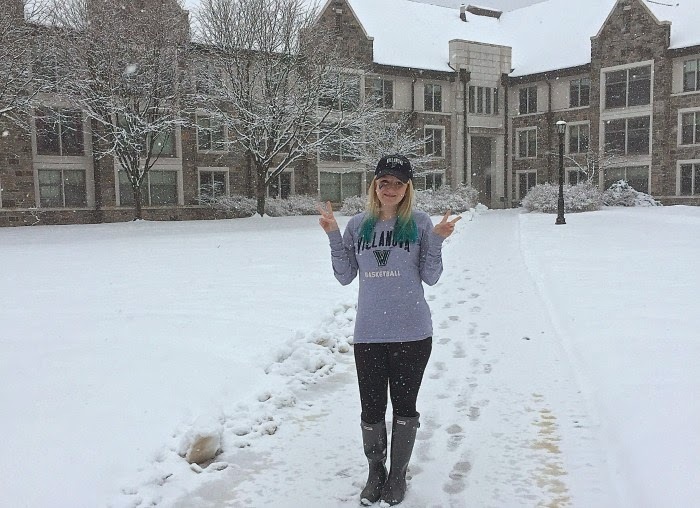 For games I like to wear one of my many Villanova shirts or sweatshirts, jeans or leggings, and boots or flats (depending on the weather!). For added spirit I love to put on one of our adorable face decals and throw on a baseball hat. 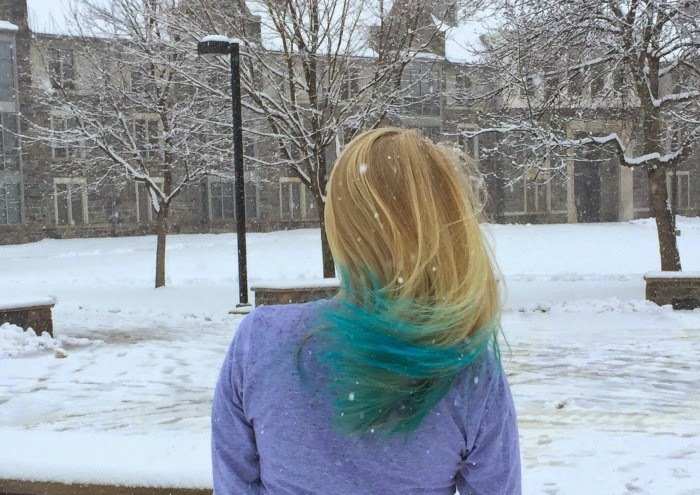 I knew for March Madness though I had to step up my look to really support our team, this is where my awesome blue hair, dyed with Garnier Color Styler, comes in. Garnier Color Styler comes in 5 colors (perfect for matching to your school colors!) and gives intense wash out color to your hair. It's water based and creates a thin color coat using clay and polymers to help the color adhere to the surface of your hair, meaning there is no damage being done. As you can see the color it delivers is quite vibrant and the best part is that that it will not rub off or stain your clothes like some other temporary dyes. The best part about it though is that applying it is super easy. -Put on an old t-shirt so that you don't get dye on anything while you're applying it. -Make sure your hair is clean, dry, and completely free of tangles. -Put on the reusable gloves and vigorously shake the bottle of dye. -Put a few drops of dye on your fingers and rub them together (do not skip this step and apply the dye directly to hair). Start off with only a few drops to see how much you will need to get the desired color, you can always add more as you go. 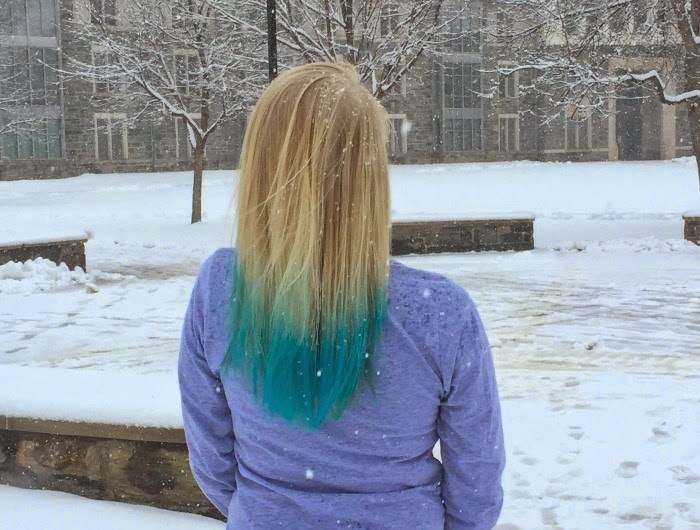 -Apply a thin coat of color to the ends of your hair to dye the tips like I did. Feel free to slowly add more dye until you get the desired color. -Continue this until all the tips of your hair are coated. -Wait for your hair to completely dry, use a blow dryer if desired. -Brush through to set it. -If you got color anywhere you do not want it you can use a bit of oil to remove it. -This will last for 2-3 shampoos, but may last longer for some. Before dying I highly recommend checking out Garnier's YouTube channel, there are tons of fun videos that show you a variety of different styles you can create with Garnier Color Styler. Before using the Color Styler I had never dyed my hair with anything before so this really shows the serious commitment I have to my team! I'm obsessed with how it came out and feel like it really completed my March Madness look. I would say this is a must have for anyone looking to really show off their team spirit and root on their school in the tournament. I'm also already thinking of ways I can incorporate Color Styler into my game day looks for next year! 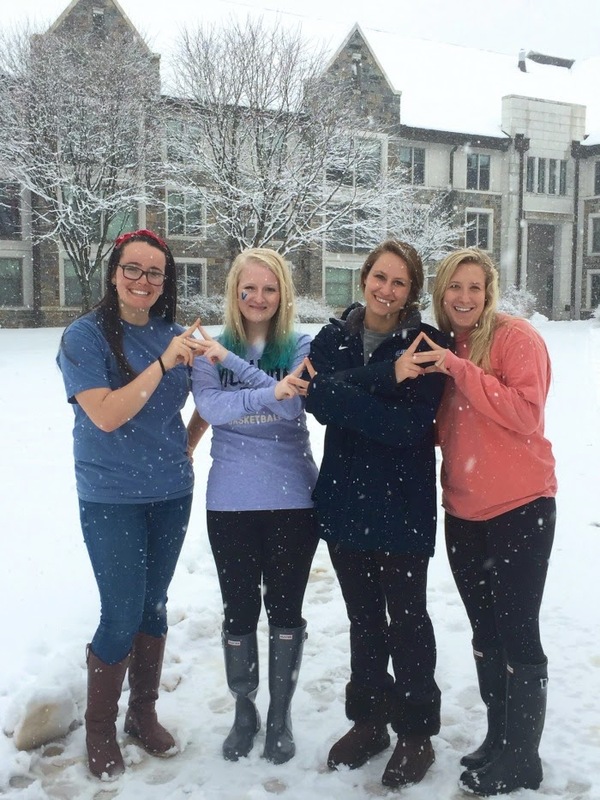 My sweet sorority sisters stopped by when one of our other sisters was taking pictures of me. After everyone finished chatting about my hair (it's a big hit!) we had to take some cute pictures together! Looking to add the perfect finishing touch to your March Madness look or just to add a little color to your everyday style? 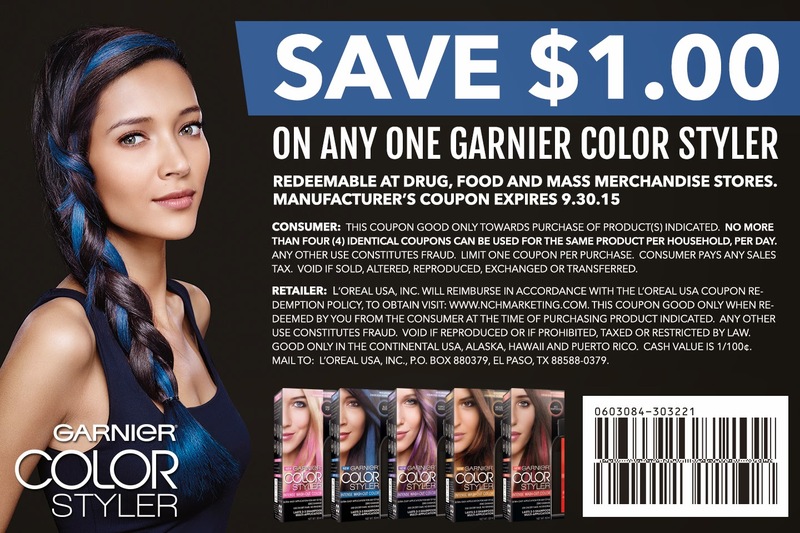 Use the coupon below or click here to download it for a dollar off on Garnier Color Styler. *This is a sponsored post in partnership with Garnier and Her Campus Media. All words and opinions are my own. 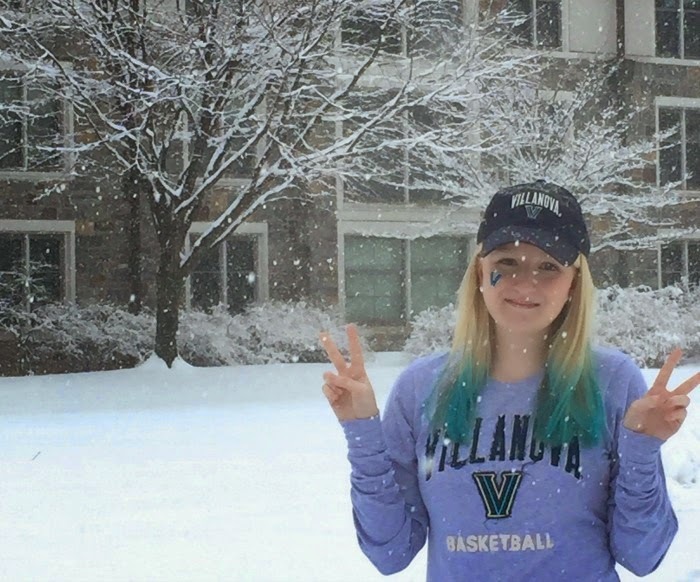 It must be so fun to be on campus now...I can't imagine all the excitement with the basketball team! Your hair came out adorable! I can only imagine the excitement buzzing around campus before this weekend! I work in Wayne, right down the street from campus, and it's all everyone has been talking about. They put up a great fight! I love the blue in yours! So adorable! What great hairstyle you have! The hair color perfectly suits you. Well I also have perfect straight hair but I really want to change my hairstyle. So I have been thinking to buy a best curling iron. Could you please suggest a good online megastore for purchasing the hair tools? I love that the heat distribution is very even . Also the heat settings are all digital which is great because you know the exact temperature at all time. This wand also heats up so quick it takes less than a minute to get up to 400 degrees. Also nice that they threw in a heat protective glove.